Date: Wednesday 10 August 2016. Venue: New Art Exchange, 39-41 Gregory Boulevard, Nottingham, NG7 6BE. Area: Forest Fields / Hyson Green. It’s just round the corner from the Forest tram stop / Forest park & ride / Goose Fair site. By tram, 10 mins north of city centre. Age range: All ages and standards, including beginners, including adults. Tap shoes available to borrow, from child size 10 to adult size 13. Smaller children can wear their own shoes – ideally with a hard sole. Price: FREE! because it ties in with the Dissonance exhibition, with Beverley Bennett’s art, which is currently on at the NAE. Booking: via event info page at the NAE site, or by ringing NAE reception on 0115 924 8630… or just by going there before the day and talking to the reception people. Places limited. Later that same evening, 8pm-9pm, they’ll be playing at NAE in their trio “Untold Rhythm”, a combination of tap dance, spoken word and melody. This performance is not really aimed at children, but children who are old enough to sit still and listen for an hour are very welcome. Again, free and please book tickets in advance, same link & phone number. 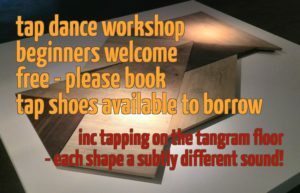 This workshop ties in with the “Dissonance” exhibition, where Nottingham-based artists (dance, spoken word etc) take inspiration from Beverley Bennett’s beautiful abstract drawings. As part of the exhibition, artist Chiara Dellerba created the “tangram floor” and Jessica Murray of Untold Rhythm improvised dances upon it, at three different locations around Hyson Green. A video of the dance expedition forms part of the exhibition, along with a spoken word video from Dave “Stickman” Higgins of Untold Rhythm. 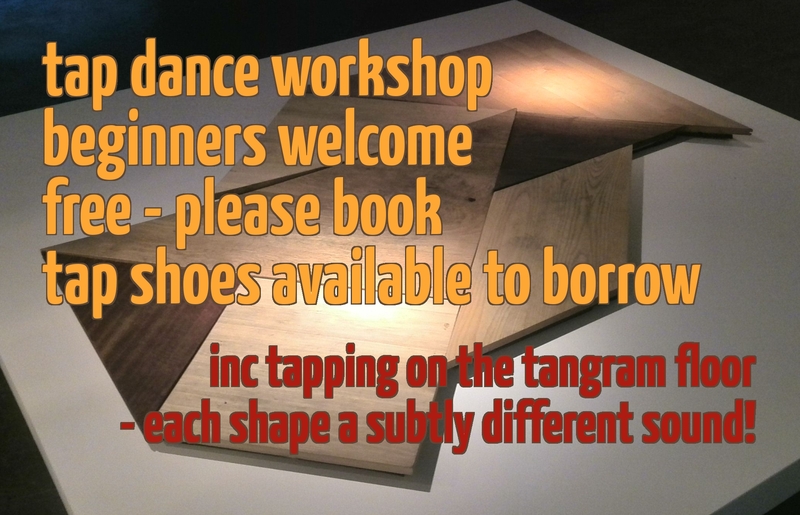 At this workshop, Jess will introduce you to some tap dance moves, Stickman will provide live music, and the tangram floor will be out for everyone to explore its various subtly different sounds! To get the most out of the workshop, you might like to visit the exhibition first. But if you don’t, that’s fine too – the workshop will still make sense without the rest of the exhibition. Parents may like to note that as part of a parallel exhibition, there’s currently a lovely “children’s art” room at the NAE, with paper, pens, stickers, dressing-up clothes, electronic screens with a drawing app, etc. Access to the children’s art room is free and no need to book. Aimed at: everyone who enjoys exploring dance, of any age or standard! Children must be accompanied by an adult. Map showing New Art Exchange. Nearest tram stop: “The Forest“. All trams going north out of the city pass through this stop. Tram information. The L14 runs every half hour to “Hyson Green Asda” stop. Turquoise Line buses (77 78 79) head west from town to “Player Street” bus stop. From there, you can cross the road, walk down Oldknow Street (with Bridlington Street playground on your left), turn left into Birkin Avenue, turn right onto Gregory Boulevard, for a total of about 600 yards’ walk. Yellow, Brown, Purple and Lime line buses head north out of town and stop by the Forest, at stops named “Forest Recreation Ground” or “ncn Clarendon College“. From there, you can walk west along Gregory Boulevard or across the Forest, around half a mile. Parking: There is usually parking at the Park and Ride site at that time of day. Access: The New Art Exchange has flat access, proper wheelchair-accessible toilets, and lifts to all floors. The only inaccessible space is the actual staircase; this sometimes has artwork on display, but isn’t the location of the Dissonance exhibition. There are two “Blue Badge” spaces next to the building. For more info, see the New Art Exchange access statement (PDF), or contact info@nae.org.uk or 0115 924 8630.